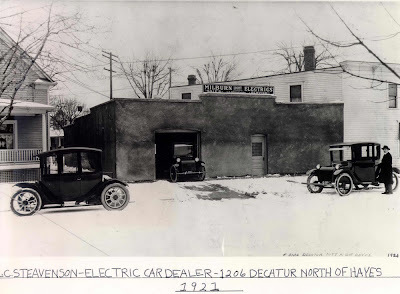 In 1921, L. C. Steavenson was the dealer for the Milburn Light Electric car at 1206 Decatur Street in Sandusky. In 1917, Mr. Steavenson worked at the Milburn Wagon Company in Toledo. From 1915 to 1923, the Milburn Wagon Company manufactured Milburn Light Electric automobiles. 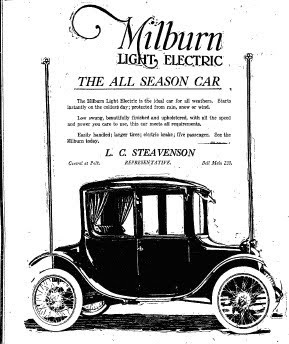 An advertisement in the March 19, 1920 issue of the Sandusky Star Journal for the Milburn Light Electric stated that it was “The All Season Car,” which started instantly on the coldest day, and was easy to handle. An article in the Toledo Free Press reports that the Milburn Electric car was popular in the United States. It was used by President Wilson’s Secret Service unit. Leigh Chadwick Steavenson eventually moved to Cedar Rapids, Iowa, where he passed away in 1950. He was survived by his wife, the former Francis Koch. Mr. Steavenson was a Veteran of World War One, and he was a member of Grace Episcopal Church in Sandusky. Oh thank you so much for this post. I have shared it with my grandchildren. How neat. A great article indeed and a very detailed, realistic and superb analysis, of these books, very nice write up, Thanks. Such a nice write up, it is really interesting.. The electric car in a great innovation nowadays, i think is a goop option not only to save money even more now the fuel is very expensive, but it could work to save our planet of the pollution environment. i think costa rica investment opportunities must be approach. I regocnize that building. wasn't it next door to Macaluso's grocery store on Hayes Ave.